Retro and vintage are the buss words these days. So maybe this is the time to think back of the days that you had those monochrome screens on your old noisy PC. Of course an old serial mouse with a ball inside would not really work any more on your modern PC or Mac and that is why we found you this. 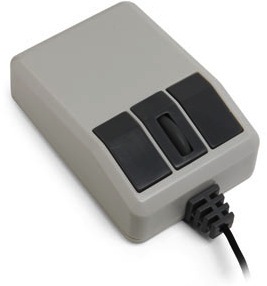 This is Retro looking USB mouse but with all the modern features. First off all it is USB and it’s optical and even has a scroll wheel. Yes making it wireless would be pushing it a little bit to much so you will be like in the olden days be stuck with the wire. So lets pimp your desk with this Retro USB Mouse.